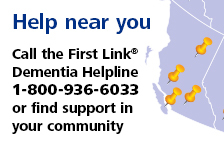 Terms and conditions | Alzheimer Society of B.C. Alzheimer Society of Canada authorizes you to view or download a single copy of the material on the Alzheimer Site solely for your personal, non-commercial use if you include the following copyright notice: "Copyright 2011, Alzheimer Society of Canada. All rights reserved." and copyright and proprietary rights notices of other parties that were contained in the Content.